A nice windy day for a walk. I’m going to mow this field in a couple of months, so I’ve been out checking conditions to see what I’ll have to deal with. We’ve had heavy rain and that means more growth. This means more material to cut and an increase of material left on the ground afterwards. It will also make it harder to see where I’m going, so I’ll have to be careful not to mow over an ant hill or break my leg in a ground hog hole. I’ve also been checking the progress of seed maturation in hopes of collecting some seed this week. I wouldn’t even try to gather seed with the wind blowing this hard. It looks like these stalks have already lost some seed. The seed heads I checked were developing and will probably contain ripe seed in a couple of weeks. The sparrows don’t worry about the seed being mature and have been busy feeding in this field. The winds get some good wave action going across these stands of Indian Grass. The grass is pointing out the direction of the prevailing wind. A lot of seed from prairie plants is distributed by the wind. I’ve watched many species of plants colonize this field and then begin their expansion along the path of the prevailing wind. The grass is pretty thick in some spots. If I delay mowing until the grass is dry and brittle, the residue shatters into small pieces. The first time I mowed a field, I was concerned about the cut grass forming a mat that would inhibit spring growth. This proved not to be a problem. The thickest of the residue I left was still much less than occurred naturally when a swath of Indian Grass went down on its own. Something has already begun cutting the Indian Grass. These stems were cut and neatly stacked. I’ve not seen this in the fields before. This field was last mowed in December 2006. Three growing seasons have gone by and here’s a four foot tall cedar. If cedars are cut leaving no green growth, they will die. The mower doesn’t cut this size cedar low enough to the ground for it to be killed. I carry pruners with me as I mow, so I can cut these larger cedars off flush with the ground. Of course, I find other things while I’m walking. This is the fruit of the Horse Nettle, Solanum carolinense. Despite the fact that the wind was carrying this boneset seed head along a five foot arc, the caterpillar never stopped eating. If it had lost its grip, it probably would have been thrown about 15 feet. Leaves of the Cut-Leaved Grape Fern, one of my favorites. 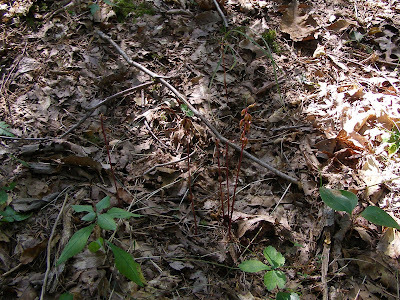 The stalk on the right belongs to the fern. At the top of the stalk is the sporophyll, a branched structure holding the spore cases. If everything goes well, this field should entice the Grasshoppper Sparrows to nest here instead of nearby hay fields where nests are invariably lost during the first hay cutting. The mushrooms aren’t really towering over my head, but with all the rain we’ve been having recently, they are growing quite large. With over five inches of rain this month, Blue Jay Barrens has had the third wettest September since I started keeping records 23 years ago. The rain has brought on the fungi and I’ve been enjoying the opportunity to photograph them. This resembles an Orange Earth Tongue fungi, except that it was growing from a log when the book said it should be growing from the ground. 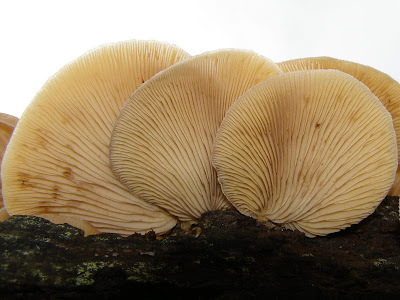 The underside of the Pancake Fungi. 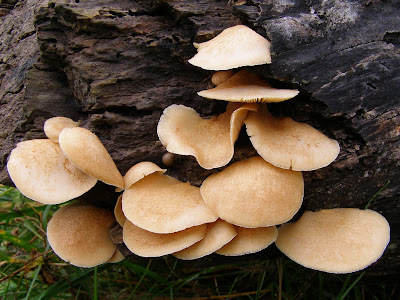 A standard set of fungi mug shots requires top view, side view and bottom view. 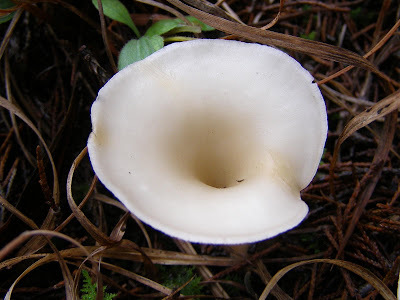 This is a fungi know as the Wolf’s-milk Slime (Text book name). At this stage, these balls contain a orange colored paste, some of which can be seen escaping from the middle ball on the left. 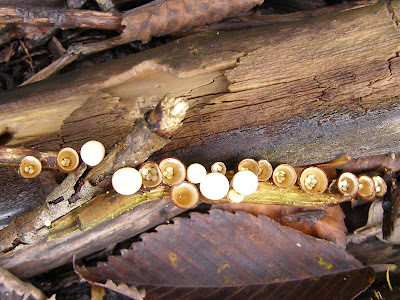 The dark colored balls are the same species with the spores nearly ripe enough to release. These tiny fungi give a nice frill to this old cherry stump. 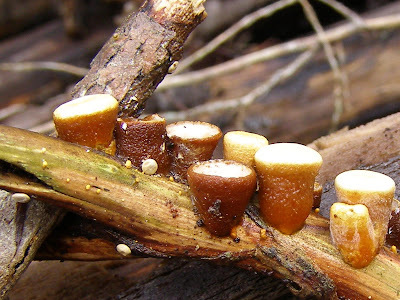 This shelf fungi grew rapidly enough to capture a stalk of grass. 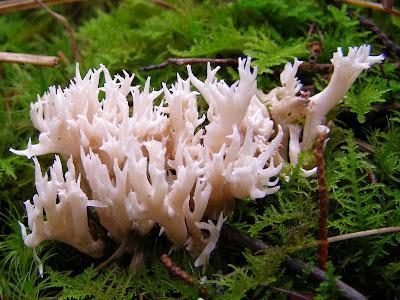 A tiny fungi known as Crested Coral. If a tree fell in the woods, would this ear hear it? 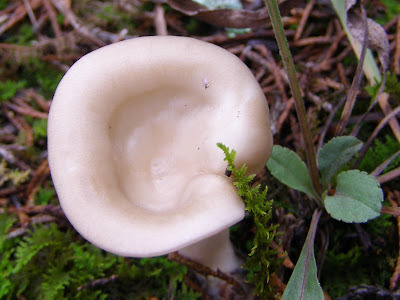 There were several of these fungi in a cluster, but only one looked like an ear. I think this moss caught against the cap and interfered with the development of the cup. This is what all the rest looked like. Beneath the ninja disks. Looks like quite a labyrinth. 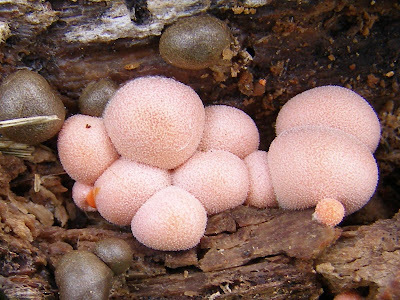 We’ll end with these lovely little fuzzy fungi. I hope we have a year like this when I’m ready to seriously study fungi identification. In July I found a single White-egg Bird’s Nest Fungi. It was very exciting because it was only the second time in my life that I had ever seen such fungi. 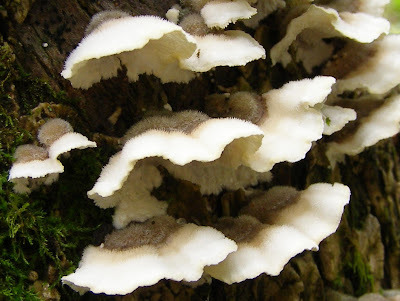 Yesterday I found vast colonies of this fungi growing on old cedar branches in some of my brush piles. This one looks more like lima beans in a bowl. 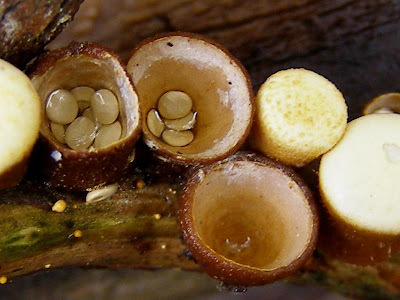 The fungus grows as an enclosed body in which the eggs form. 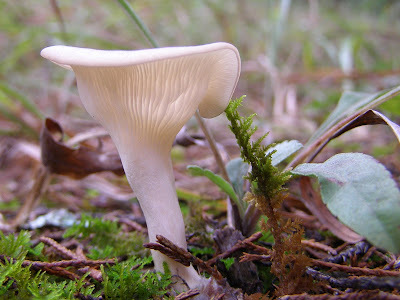 The eggs contain spores and when the spores are ripe, the cap on top decomposes. What’s left is the nest shape with the eggs inside. Rain drops falling into the open nest splash the eggs up and out. As the egg leaves the nest, it uncoils a cord and anchor type structure that allows the egg to catch on the surrounding surface. 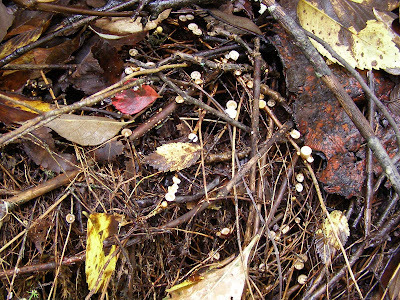 Mycelium grow from the egg to begin development of a new colony of fungi. There are four ejected eggs in this photo. One is beside a nest, two are on the underside of the stick and one is on the stick above the nests. Here is part of one of the colonies. The nests are really hard to see. I’ve been told that this is the best time of the year to find these particular fungi. Maybe I’ll see them more often now that I know what to look for. Don’t worry, there’s nothing unappealing here. This is just sort of another type of plant. You are looking at a collection of cyanobacteria known as Nostoc. Cyanobacteria are a type of photosynthetic bacteria. This means that they capture energy from sunlight in the same manner as green plants. 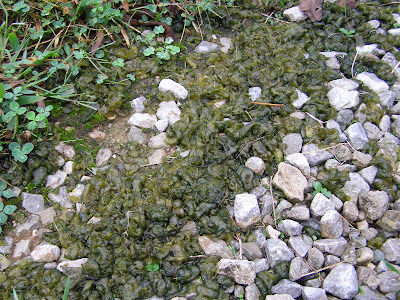 Nostoc generally grows in areas of poor barren soil and is not really noticeable until heavy rains wash a bunch of it into a pile. This shot was taken along the edge of my gravel driveway. The same phenomenon occurs in the barrens, but the effect is not as dramatic as here. 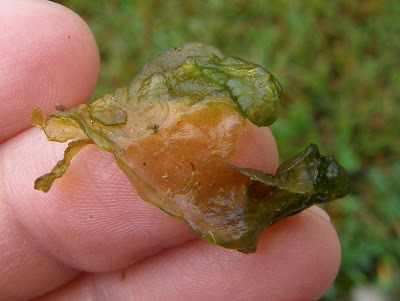 A Nostoc colony is composed of long strands of bacteria contained within a gelatinous membrane. After being moved along by water, the colony looks like a green blob. The blob can be rolled out to show that the colony is actually a thin layer. 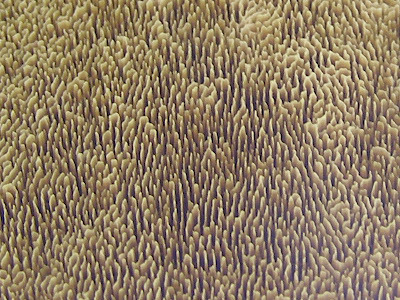 As the colony grows, this thin layer moves out across the soil surface. It requires moisture in order to function and grow. During times of dry weather the colonies dehydrate and resemble dark green or black cornflakes. Heavy rains hydrate the colonies and move them around. 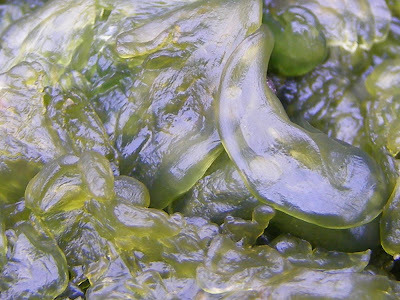 Nostoc has the ability to convert atmospheric nitrogen into organic forms usable by plants. 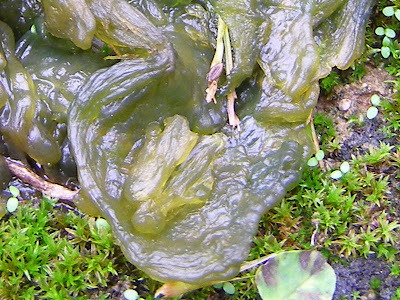 This makes the Nostoc a valuable aid to plants trying to colonize bare, low fertility soils. 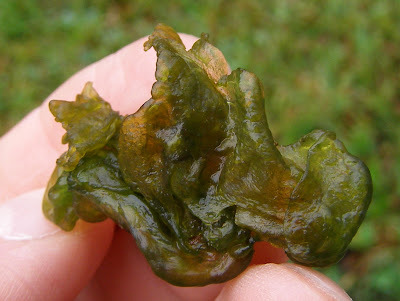 It’s also funny to hide a Nostoc colony in the palm of your hand and watch people’s reactions when they think you’ve sneezed out something really nasty. 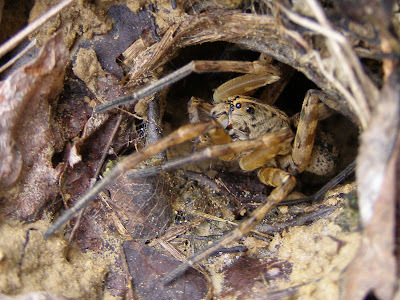 I was walking through one of the barrens when I spotted this wolf spider wrestling with a Burrowing Wolf Spider at the mouth of a spider burrow. As I approached, the dark colored Burrowing Wolf hurried down into the burrow. Seconds later, the lighter spider followed. I thought this was odd behavior and wondered what kind of activity I had interrupted. I used my flash to get a shot down the burrow and caught the lighter spider a couple of inches below the surface. No sign of the darker spider. At the flash, the spider shot back up to the entrance to the burrow. I waited for about five minutes to see if the other spider would come back up. It didn’t, so I wandered off to look around a bit. 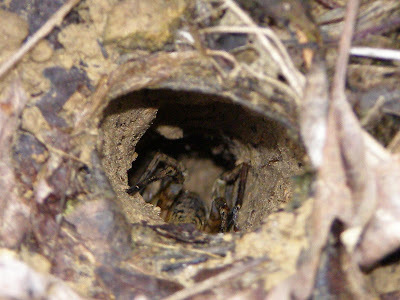 When I came back, the spider had fully emerged from the burrow. 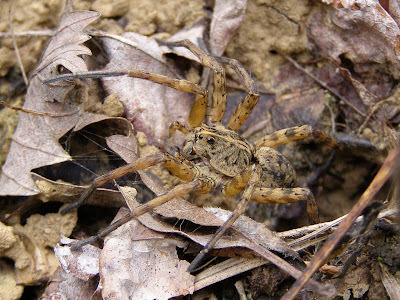 Now I could see that this was not a burrowing spider. 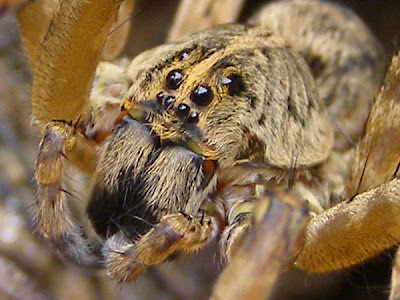 Maybe this spider was just wandering by and got grabbed by the burrow owner. 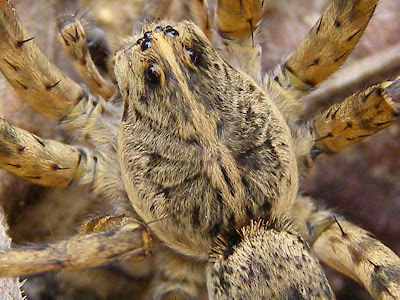 It’s quite a pretty spider. Wouldn’t these make cuddly pets if they grew to be about twenty pounds? 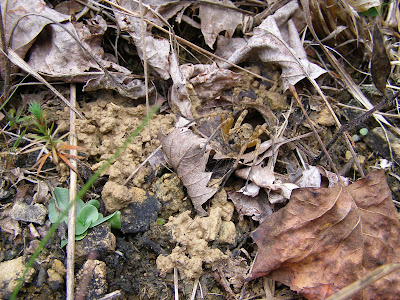 The light colored soil is what was excavated from this burrow during construction. It doesn’t look like it has experienced much weather. This may be a new burrow. 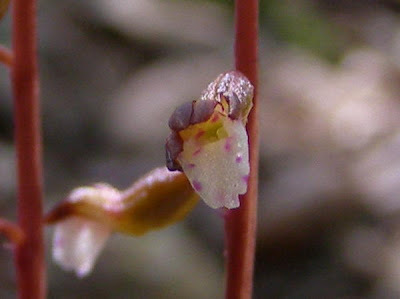 Here’s another neat little orchid. 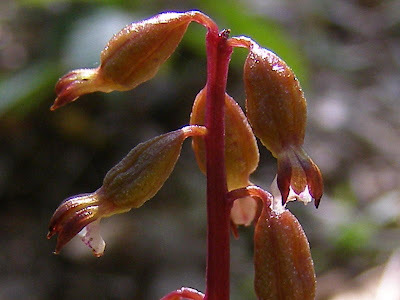 This is called Late Coralroot, Corallorhiza odontorhiza. It grows in the shadows of the woodland and is hard to see with its nine inch height, narrow stem and tiny flowers. You have to get close to even see if this flower is blooming. Some of the flowers never open and are self fertile. 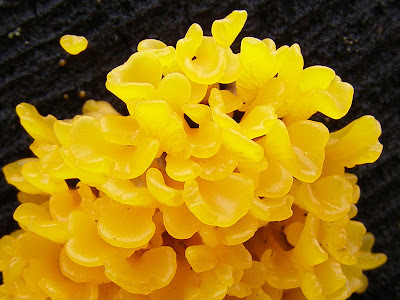 Others, like the one shown, are fertilized by some type of insect. 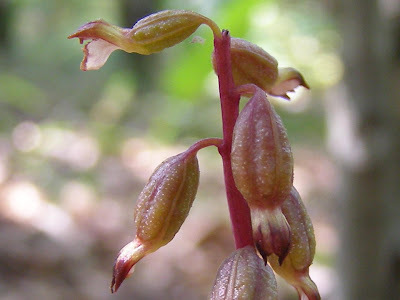 Some types of orchids are rare because of the loss of the specific insect providing pollination service. A self fertile option can allow a population to maintain itself, but doesn’t allow for any genetic exchange. 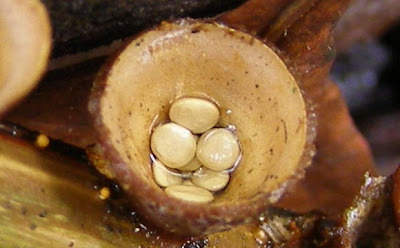 Tiny seeds will develop inside the pods. The seeds are almost dust-like, but wind and rain won’t move them very far from where they develop. 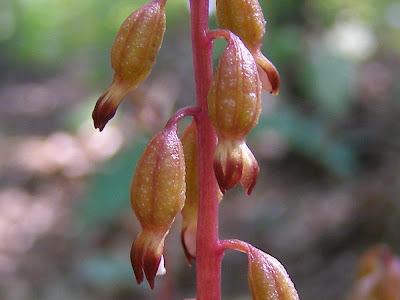 The stems and flowers are predominately a red or purple color. There are no leaves and because it has no chlorophyll, the plant doesn’t produce its own food. The bulk of the plant is found growing beneath the soil surface as an underground stem called a rhizome. 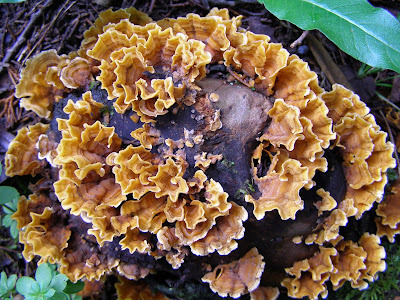 Coralroots are parasitic on Mycorrhizal Fungi, a condition known as mycotrophism. 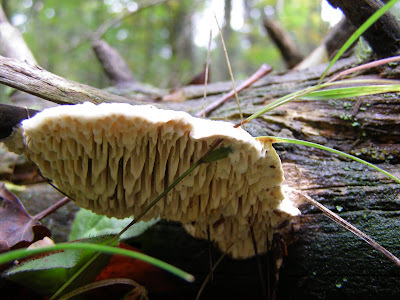 Mycorrhizal Fungi play a major role in the decomposition and transport of elements within the soil ecosystem. 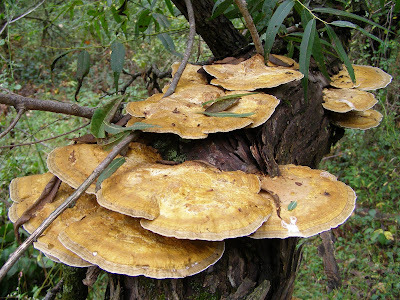 Research has shown that these fungi not only benefit plant growth in general, they are essential for the survival of some species. This was a good bloom year for this species. There were many dozens of flower stalks in this one location. It’s possible that it may be several years before we have blooms here again. Despite the lack of blooms, the plant can be healthy and prospering underground. I have to begin with a cautionary statement. Some people may be disturbed by the following images. I certainly am. I got close to my south-western property line and found some little gifts from the neighbors delivered to me by the prevailing wind. I’m at peace with the ancient junk left by past generations, but I despise contemporary trash that someone thoughtlessly let escape. A giant snake skin? That would have been exciting. At least this plastic was low enough in the tree for me to reach and still fresh and pliable. I hate to find old brittle plastic that crumbles at the touch. I’ve spent a lot of time picking tiny plastic bits off the ground. I usually walk this line in October to check the fence, cut back trees and pick up trash. Most trashy bits don’t disintegrate too much in a year’s time. Here is an old plastic grocery bag. This item was specially designed to be carried long distances by the wind. At least it’s still serviceable and will hold the other trash I’ve collected. Styrofoam meat trays are great at snuggling close to the ground and smothering little plants. I’ve purposely left a buffer strip of trees along the property line to capture traveling debris like this. Better to have the trash concentrated in one strip than scattered all over Blue Jay Barrens. A spun fiber fabric that I often see used in new building construction. Well, everyone knows that once an area is designated a construction site, you can just throw your scrap material any old direction and not worry about it.